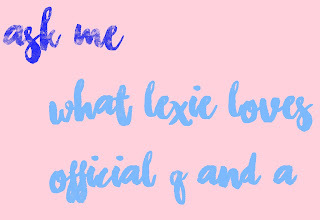 What Lexie Loves: Q to the A! Hola Lexicans! I was reading Anna's blog recently and I saw she was doing a Q&A which reminded me - I haven't done a Q&A for ages either (for a year to be precise ;)). I will be needing questions for my Q&A (duh!) and this can be anything about me to completely random things like 'Cookies or cookie dough?' which I was asked last time (and by the way I answered cookie dough AHH it's just so good <3) to questions blog-related. I cannot guarantee I will answer ALL you questions, but I do love it so I may end up doing so. Feel free to spam me with questions in the comments or email me. Sorry for such a short post, but I'll be back answering your questions soon so ASK AWAY! What is your view of the purpose of blogging? When you find yourself bored what is the first thing you do? if you could switch places with anyone in your school, who would it be?